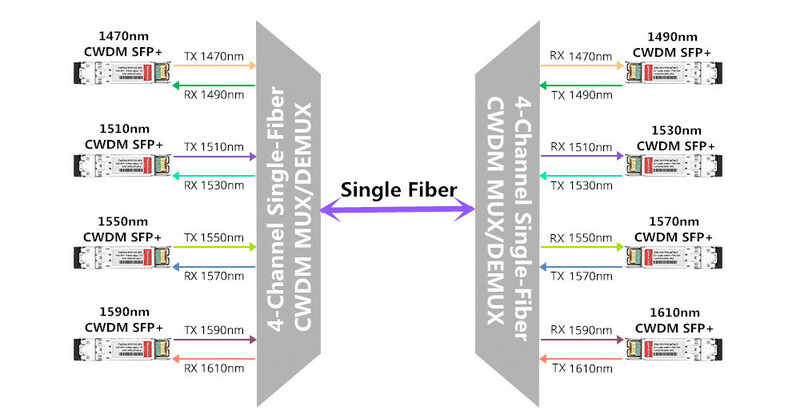 WDM refers to the process of multiplexing optical signals onto a single fiber. Each optical signal is called a lambda. It typically falls into the 1500-1600 nanometer(nm) range. This range is called the WDM window. 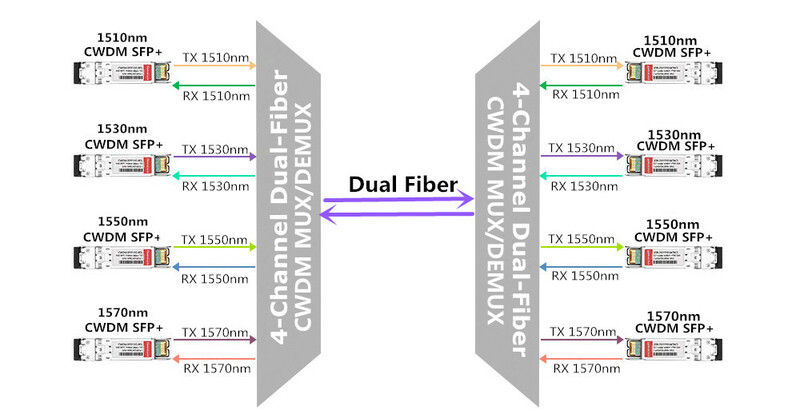 WDM allows existing networks to scale in bandwidth without requiring additional fiber pairs. This can reduce the recurring cost of operations for metropolitan-and wide-area networks significantly by deferring fiber installation costs. WDM can also enable solutions otherwise impossible to implement in situations where additional fiber installation is not possible. Where C stands for constant and refers to the speed of light in a vacuum; therefore wavelength cannot be changed without also changing frequency. Because of this, many people confuse WDM with frequency division multiplexing(FDM). Two factors distinguish WDM from FDM. First, FDM generally describes older multiplexing systems that process electrical signals. WDM refers to newer multiplexing systems that process optical signals. Second, each frequency multiplexed in an FDM system represents a single transmission source. Bycontrast, one of the primary WDM applications is the multiplexing of SONET signals, each of which may carry multiple transmissions from multiple sources via TDM. 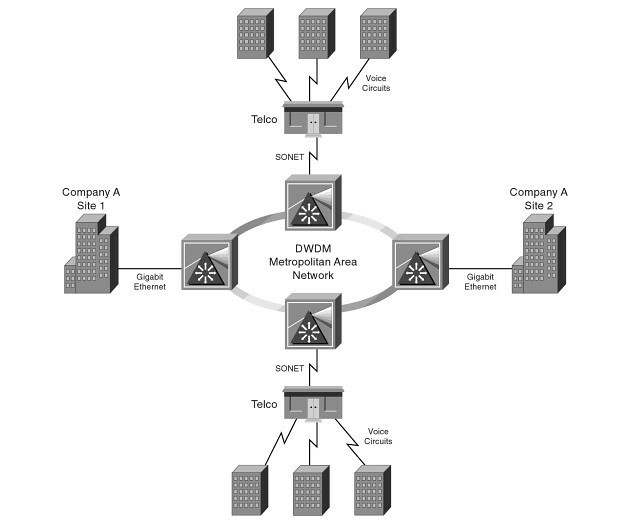 So, WDM combines TDM and FDM techniques to achieve higher bandwidth utilization. DWDM refers to closely spaced wavelengths; the closer the spacing, the higher the number of channels(bandwidth) per fiber. The International Telecommunication Union(ITU) G.694.1 standard establishes nominal wavelength spacing for DWDM system. Spacing options are specified via a frequency grid ranging from 12.5 gigahertz(GHz), which equates to approximately 0.1 nm, to 100 GHz, which is approximately 0.8 nm. Many DWDM systems historically have supported only 100 GHz spacing(or a multiple of 100 GHz) because of technical challenges associated with closer spacing. Newer DWDM systems support spacing close than 100 GHz. current products typically support transmission rates of 2.5-10 Gbps, and the 40-Gbps market is expected to emerge in 2006. You can use two methods to transmit through a DWDM system. One of the methods is transparent. This means that the DWDM system will accept any client signal withou special protocol mappings or frame encapsulation techniques. Using this method, a client device is connected to a transparent interface in the DWDM equipment. The DWDM devices accept the client is optical signal and shift the wavelength into the WDM window. The shifted optical signal is then multiplexed with other shifted signals onto a DWDM trunk. Some DWDM-transparent interfaces can accept abroad range of optical signals, whereas others can accept only a narrow range. Some DWDM-transparent interfaces are protocol aware, meaning that the interface understands the client protocol and can monitor the client signal. When using the transparent method, the entire end-to-end DWDM infrastructure is invisible to the client. All link-level operations are conducted end-to-end through the DWDM infrastructure. Using the second method, a client dvice is connected to a native interface in the DWDM equipment. Fow example, a Fibre Channel switch port is connected to a Fibre Channel port on a line card in a DWDM chassis. The DWDM device terminates the incoming client signal by supporting the client is protocol and actively participating as an end node o n the client is network. For example, a Fibre Channel port in a DWDM device would exchange low-level Fibre channel signals with a Fibre Channel switch and would appear as a brdge potr(B_Port) to the Fibre Channel switch. This non-transparent DWDM transport service has the benefit of localizing some or all link-level operations on each side of the DWDM infrastructure. Non-transparent DWDM service also permits aggregation at the point of ingress into the DWDM network. For examle, eight 1-Gbps Ethernet(GE) ports culd be aggregated onto a single 1–Gbps lambda. The DWDM device must generate a new optical signal for each client signal that it terminates. The DWDM device must generate a new optical signal for each client signal that it terminates. The newly generated optical signals are in the WDM widow and are multiplexed onto a DWDM trunk. Non-transparent DWDM service also supports monitoring of the client protocol signals. To the extent that client devices are unaware of the CWDM system, and all link-level operations are conducted end-to-end, transparent CWDM service is essentially the same as transparent DWDM service. Transparent CWDM mux/demux equipment is typically passive(not powered). Passive devices cannot generate or repeat optical signals. Additionally, 10As operate in a small wavelength range that overlaps only three CWDM signals. Some CWDM signals are unaffected by 10As, so each CWDM span must terminate at a distance determined by the unamplified signals. Therefore, no benefit is realized by amplifying any of the CWDMsignals. This means that all optical signal loss introduced by CWDM mux demux equipment, splices, connectors, and the fiber must be subtracted from the launch power of the colored GBIC/SFP installed in the client. Thus, the client GBIC/SFP determines the theoretical maximum distance that can be traversed. Colored GBICs/SFPs typically are limited to 80 km in a point-to-point configuration, but may reach up to 120 km under ideal conditions. Signal monitoring typically is not implemented in CWDM devices. This entry was posted in CWDM network, DWDM system, WDM & Optical Access and tagged CWDM mux demux, CWDM system, DWDM System on June 26, 2014 by Admin.